Have you ever heard the expression "you get more bees with honey, than vinegar"? For the sake of my point with this article, it suggests that one can have a difference of opinion on a potentially controversial subject and still have a decent correspondence with your fellow man at the same time. I'm familiar with the concept because I have friends who don't necessarily hunt or sympathize with trapping activities; even some who don't partake in the consumption of meat. Somehow in this crazy world, we manage to "agree to disagree" and move on to other topics of mutual enjoyment - like my admiration for the design work of Neville Brody, or sharing in a mutual disdain for typefaces like Papyrus. In a nutshell, I've whipped up my fair share of criticism towards public figures and organizations from time to time. But these days, I try to articulate my points and advocacy in a broader, non-aggressive and mutually entertaining way. The honey seems to be getting me more bees lately. I recently noticed a spike in web traffic to this website, as well as a peak in fans and followers to the accompanying Facebook page. I figured I must've been doing something right to be reaching these new supporters. Then I realized the local anti-hunting and anti-trapping groups were taking screen-shots of my pictures and posts, and sharing them on their own pages in what I can only assume was an attempt to get a rise out of their own followers. (They've even gone as far as to plaster their slogans and hashtags over my images - now that's just rude!) Funny thing about sharing public postings on social media - just because your followers may support your cause, their friends and friends of their friends, who also see the post, may not. So thanks for the free advertising and new followers - I guess. A similar event happened some years back. I wrote a letter to the local newspaper in support of regulated trapping. These groups, in an attempt to intimidate and take charge of the narrative, jumped to social media and called on their members to comment negatively on my letter in a guerilla style web-attack. The amount of random people "blowing up" the comment section actually sent my article to the top of the newspaper's web site, which thanks to online algorithms, skyrocketed my letter to the front of the newspaper's home-screen, because the website interpreted it as a popular topic from the amount of comments. Thanks to these people and their attempt to single me out individually, they successfully put the article, with the title "Support Trapping in NH", on the front page of the paper's website for several days - front and center for all to see. The same concept seems to spill into new Trapper's Education courses. Trapper Ed classes in New Hampshire are in high demand lately. I always ask students why they are interested in learning how to trap. A more common reason I am accustomed to hearing is "because I heard someone online or in the newspaper speaking badly about it, and I wanted to get the other side of the story". I've said it before and I'll say it again - the worst thing anyone can do for the future of trapping is to stop talking about it. Even when someone speaks negatively about trapping, it gives those of us who support it a platform to rebut the extremism and tell our side. Very few people are interested in one side of the story these days. There has always been a clear message from anti-hunting groups regarding their opposition to the idea of hunting and trapping. For most, the consistent calls to ban hunting and the over-exaggerated criticisms of trapping activities just comes off as an attempt to intimidate, dominate, and control a narrative. But more recently, the activism derived locally has pushed far from promoting a message of opposition to hunting and trapping, and mutated into a brutal campaign against hunters and trappers - individually. Those of us on the "front lines" recognize this for what it is, an attempt to silence people who believe what we do adds a benefit to wildlife management and conservation (as opposed to dressing up in a furry suit with a protest sign and trapsing around a sidewalk). More and more lately, the campaigning of local anti-hunting advocates has diverted away from their aversion to animal usage, and focused on verbally attacking local women, blocking and berating anyone who doesn't follow their strict religion online, and even chastising state appointed biologists who base their management procedures on internationally renowned science. Their seething hatred for other people, rather than just the activity of hunting, is beginning to show. Even some of their own members have contacted me through this very website, citing that the extremism these groups now promote has moved far past "advocacy" that some people signed up for, and into reactive sensationalism which few want to stand behind. When these groups launch attacks on individual people, it comes off less as "a voice for wildlife", and more of an anti-human campaign. 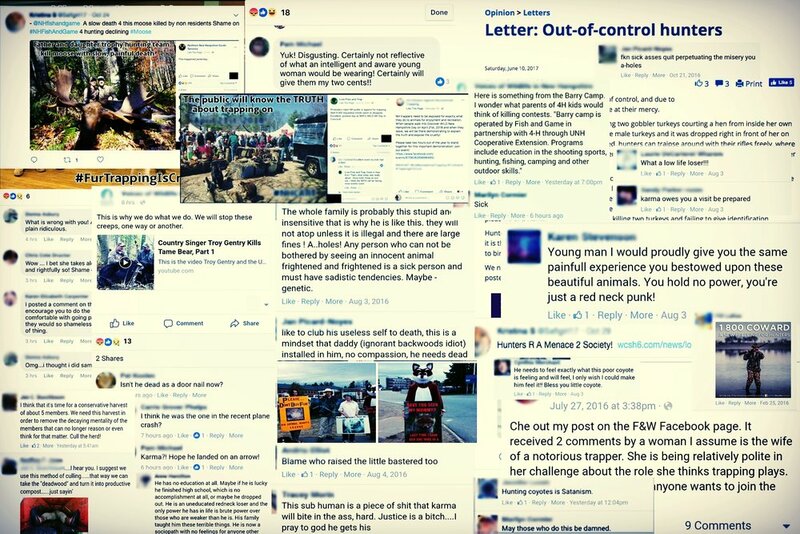 A screen-shot from a local public NH animal rights social media page, taken during the protest of last year's Fish & Game event. Case in point: The NH Trappers Association mans an educational booth at the NH Fish and Game's annual "Discover Wild NH Day" event every year. The event is geared towards a celebration of the Department's activities, which include conservation and management through regulated hunting, fishing and trapping activities; as well as non-game and endangered species programs. The volunteer trappers on site educate the public and children about furbearer biology, proper & humane use of these resources, and basic small-mammal characteristics. Local activists vowed to stand and protest the event this year over the Department's regulation of hunting and trapping activities - and they didn't disappoint. The signage ranged from the typical "fur is murder" slogans synonymous with animal rights activism, to calling into question the "manhood" of individuals who partake in hunting and trapping activities. One sign stood out among the others, which suggested that NH's hunters and trappers actually abuse women. As a family man and trapper myself, this particular accusation isn't only taken seriously, but resonates deeply on a personal level that has made my writing of this article extremely difficult without the use of profanity. Everyone is entitled to an opinion - even when those opinions are senseless and void of any real logic or reasoning, but to say these supposed "non-profit" organizations have struck a chord is putting it lightly. Whether you agree or disagree with the scientifically sanctioned activities of regulated hunting & trapping, this type of behavior drives far beyond the notion of free speech, and teeters dangerously close to the frantic brink of slander and poor judgement. These sentiments seemed to resonate with countless attendees of the event, who repeatedly commented about how these accusations and the over-the-top theatrics seemed to obscure any message these folks were trying to deliver. Nonetheless, the groups involved with organizing the protest and promoting this type of "hype" were very proud of the perceived message. 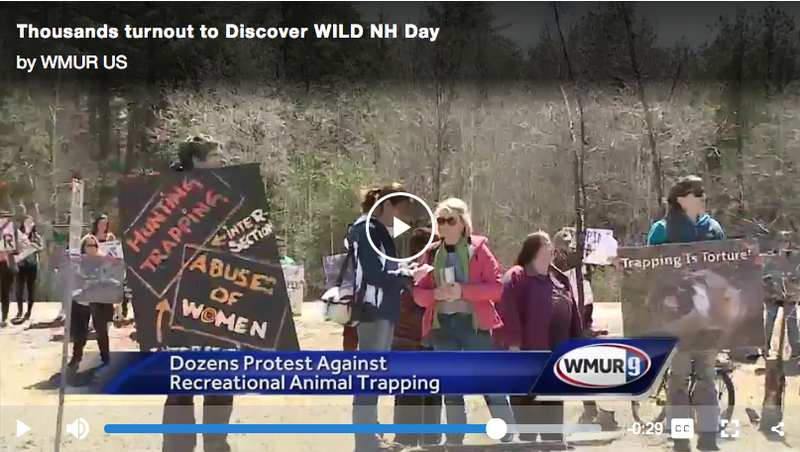 A news video still from this year's "Discover WILD NH day" protest. While volunteer trappers (many of whom are proud fathers and husbands) were inside the event educating the public and our youth about wildlife biology, this was the scene outside the event, and seems to be the message these groups want to get across. Going back a few months, these groups and their members also attacked a young local woman for accepting the donation of a fur coat from the NH Trappers Association. After stealing and then re-posting a seemingly innocent picture of the young woman standing with members of the NHTA, the members of these anti-hunting groups erupted (as they typically do) with an all-out hate-fest on her, and the NHTA members. Several of these so-called "advocates" and members of these groups posted on the young woman's social media, calling her "disgusting", "unintelligent", "shameful" and "repulsive". Hours later, these anti-hunting groups also called for a letter-writing campaign to denounce the young woman's organization over their acceptance of donations from the NHTA, a 501c3 non-profit group geared towards public outreach and conservation. Mere months before that incident, the same members from these NH and VT extremist groups verbally bullied an 80-year-old woman in the press after she was attacked by a rabid bobcat while in her garden. Elsie Dabrowski required a multitude of stitches to her face and body as a result of the attack. The response from these local groups and their members was the accusation that Elsie, a Marine veteran, "staged" the attack, so that her son, a trapper, could somehow conspire a need for a bobcat hunting season. These people went on to accuse the NH Fish and Game Department of "covering up" the ordeal when the Department determined the cat was rabid, and the injuries were determined to be the result of a shotgun blast. Whatever happened to a "get well" card and flowers? There clearly appears to be some discrepancy with regard to who actually "abuses" women. Even national anti-hunting groups can't stay away from the controversy, like HSUS executives and their sexual harassment turmoil. A recent social media post: As if promoting the asinine notion that "anyone who hunts or traps beats women" wasn't enough insanity, local activists seem to be more interested in attacking the "physical characteristics" of volunteers while continuing their message of passionately hating others. As if attacks on women aren't enough, these groups also jump behind the keyboard to proverbially "steamroll" anyone who doesn't strictly follow the guidelines of their religion against animal usage. Biologists nationwide implement regulated furbearer trapping as a means to garner important cost-free data, assist threatened/endangered species prone to depredation from abundant furbearing predators, and allow the public an opportunity to live a self-reliant lifestyle through sustainable use of these natural resources. For their troubles, the NH Fish & Game has received threats of having their Department burned down, death threats on employees and commission members, and even verbal public-shaming campaigns against appointed biologists who base management decisions off these internationally recognized concepts. Since this still doesn't seem to get their point across, these groups have now resorted to public-shame campaigns against individual hunters, trappers, biologists, and anyone in the state who supports these activities. Even New Hampshire's Governor isn't safe, being berated and criticized by these same groups for posing with public citizens of the state for which he governs - hunters and trappers are still members of the public population last time I checked. It would appear that anyone who dare speak out in support of hunting or trapping activities is subject to hate-fueled rage - all propped up for a web-based trial by the animal rights activism online jury. Insert an eye-roll emoji here - sigh. When NH's governor poses with local citizens and conservation groups of his state, he's met with threats by the local anti-hunting crowd. The bottom shot shows the individual stating she wouldn't even "touch" a trapper - a pretty hate-filled statement from someone who claims to promote "compassion". As if public shaming and cyber-bullying wasn't enough to keep these folks busy, they always seem to be lurking and waiting to "pounce" on any offhand comment to utilize as the "smoking gun" for why hunting and trapping should be done away with for good. Its why these groups don't ever really seem to get any traction with legislators and media outlets - sensationalism, for the most part, just makes people's eyes roll. Anyone fairly grounded can deduce that whatever one says about a particular activity doesn't necessarily correlate with the broader scope of all who partake in said activities. These local groups and their sympathizers often claim to know more about traps and trapping activities than trappers and biologists themselves - and heaven help anyone who tries to correct them when the wrong terminology or descriptions are improperly used. For me personally, the most tragic part of this whole debate is when these groups propagate those eccentric fairy-tales and isolated instances about trappers, they truly believe their ravings are a representation of all trappers - including myself. The wild and "creative" ways anti-hunting groups think animals are treated in traps has become so far-fetched, that even I have a hard time trying to figure out where they come from - some examples are really out there. It's painfully clear this is no longer a debate about the activities of hunting and trapping. Nowadays, all we seem to hear about is how "terrible" trappers are, and the sensationalized theories about what trappers "do". There appears to be absolutely no wiggle-room for bipartisanism, dialog or common ground, and any deviation from the one-sided view that trappers are "terrible people" is subject to criticism. And so on they march, as members of these groups continue to hang on to every syllable from any online web forum as if each quote or sentence can be twisted and molded into the next "proverbial nail" in the hunting coffin. With that in mind, I'm a firm believer that if trapping and hunting activities ever die, it'll be because the sprawling destruction of wild habitat will push us out like the animals we pursue. I'm pretty confident it won't be because someone showed up at a hunting event with a camera hidden under a pizza box to take "covert" snap shots of fur hats and bearded beaver trappers; as if it's the next "gotcha moment" for use on a protest poster. People who partake in the activities of regulated hunting and trapping are exactly that - people. What seems to elude those angry activists is the concept of modern, regulated trapping being bigger than just NH's trapper citizenry. Its bigger than NH's Fish and Game Department. Its bigger than the Northeast, and even the continental United States. Its an international understanding and scientifically supported activity which has been proven to promote healthy wildlife populations, as well as protect endangered species, and supply invaluable data to state and provincial biologists on wildlife health. I'm always amazed that some of the same people who believe in, and advocate global warming, also try to poo-poo the science behind wild game management. As humans, we are an apex predatory species of omnivore. Protest to your heart's content, but it doesn't change the fact that I personally enjoy my view from the top of the food pyramid. The wolf isn't concerned with "ethics" when he runs down dinner - he does what is necessary to survive. On the flip side of this coin, humans are the species gifted with the bigger brain - and have established ideals pertaining to humane treatment, regulation, conservation and the like. These are all brilliant concepts which should be readily supported. The dark past of the 19th century fur trade has been snuffed out by modern humane standards, heavy regulation, and evolution in trap design - facts repeatedly left out of the debate by anti-hunting groups. Trappers and state agencies do need to get better at promoting the drastic advancements made to modern regulated trapping practices. Other than that, hunters and trappers shouldn't feel the need to explain or "defend" our activities. The "non-hunting" side of society is left with that task whilst shoveling down Big Macs and tootling around with heated leather seats in their cars. A recent social media post by local activists. Notice the description of "creative ways" these people think wild animals are dispatched. Bats? Fists? Pipes!? Good lord lady, we're out trapping - not gearing up for a bar-brawl or a gang war! The problem with extremism is there's never a "correct" response to quell this kind of delusional rage. When state biologists back trapping activities up with facts and science, the science then becomes "wrong", "unfair", or "unbalanced" in the eyes of the anti-hunting crowd; unless of course that same science seeks to further restrict hunting activities. The ignorance and intimidation tactics these people are becoming known for are quickly (and thankfully) losing credibility with neutral parties. The more I see and hear from these folks recently, the more I'm convinced the argument seems to be less about "advocacy", and more about intimidation and a desire to "win" the percieved debate - at any and all costs. Whether its an unnatural fear of "never seeing an animal in their backyard again", or just disgust for animal usage of any kind, I still think you can speak your piece respectfully, and maturely. Based on the current trends discussed above, I'm inclined to believe perhaps this never really was a debate about how to manage wildlife. The moral of the story - have a cause, promote a message, but don't drag an entire culture-base of people into your convoluted diatribe. As for advocacy - keeping bees with honey seems to be more effective than dousing the hive in vinegar and then demanding someone listen.